Synchrotron-based X-ray technique, called “supercrystallography”, takes the structural analysis of nanocrystal assembly to an unprecedented new height. Both the instrumental and analytical developments were led by Staff scientist Zhongwu Wang at Cornell High Energy Synchrotron Source (CHESS). 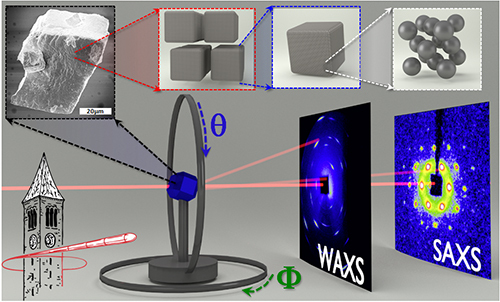 This first-of-the-kind X-ray approach together with the growth of single supercrystal and detailed structural analysis and simulation from atomic to mesoscale level was reported in Issue September 09, 2015 at Nano Letters . Like carbon atoms in graphite and diamond, nanocrystals serve as the new types of building blocks and self-assembly into various periodically ordered solids, called “supercrystal”. But unlike atoms that have only 100 elemental options from the periodical table, Nanocrystals — by tunable control of the size, shape, composition and surface decorating molecule — provide thousands of new building blocks, which can be used as atom equivalents to design and make novel structural materials with either enhanced or newly manifested properties. This emerging class of complex nanomaterials has found many applications in bioimaging, environmental sensing, electronic and optical devices, but fabrication of these materials in a designable and controllable way is still largely limited by poor understanding of how nanocrystals interact each other and orient themselves through typical shape and crystallographic plane, and develop both the translational and orientational orders over the entire supercrystal domains. To fully resolve this significant issue, CHESS staff scientist Zhongwu Wang and Ruipeng Li, CHESS postdoctoral associate and lead author, collaborated closely with several nanomaterials groups across Cornell campus and at Binghamton University and Los Alamos National Laboratory, and developed one way — supercrystallography — which allows for structural reconstruction of supercrystal at unprecedented detail from atomic, through molecular and nanometric, to mesoscale. Starting with Pt nanocubes (NCs), one of the simplest platonic shapes and the most popular catalytic metals, they were granted access to the CHESS facility and developed one protocol to grow sub-millimeter grains of single supercrystals. In parallel, they designed and assembled one portable in-house two circle x-ray diffractometer. By synchronizing two large area detectors with the small diffractometer together, they eventually succeeded in simultaneous collection of the full sets of small and wide angle X-ray scattering (SAXS/WAXS) images from the same supercrystal grain upon rotation along axes θ and ϕ (Figure 1). Figure 1: Synchronization of X-ray, small portable two circle diffractometer and large area detectors for simultaneous collection of the full sets of small angle and wide angle x-ray scattering images from single supercrystal upon rotation of sample. Suffering from lacking any analytical program of SAXS for structural refinement, they worked hard and eventually found one way, similar to that used in protein crystallography, to prescreen the candidate structure symmetry with positional match to the collected scattering patterns. Thus, the full sets of SAXS images were simulated to compare the experimental datasets for ultimate determination of the superlattice symmetry (Figure 2 and SAXS-Movie 1). 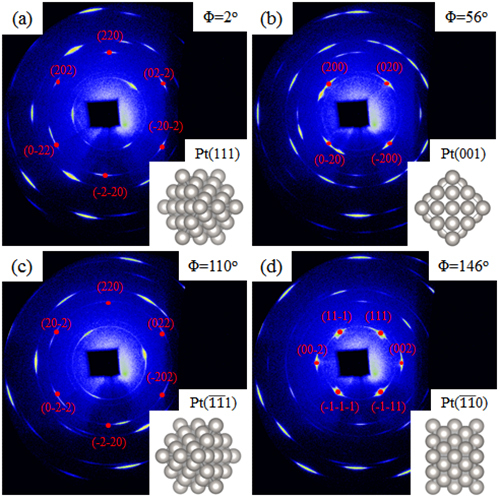 Using the WAXS images collected from the same supercrystal at identically SAXS-controlled conditions, each structural aspect of NCs at each superlattice site was unambiguously defined (Figure 3). Figure 2: Typical SAXS patterns collected from one supercrystal upon rotation of (a−d) SL at Φ = 0°, 67°, 130°, and 156° and (e−h) SL at Φ = 0°, 24°, 54°, and 90°. Each panel includes both collected (left) and simulated (right) SAXS images with insets showing the matched crystallographic orientations of rhombohedral superlattice (SL). The angular difference between SL and SL is 30° at Φ = 0°. Figure 3: Representative WAXS patterns collected upon rotation of SL at (a) Φ = 2°, (b) Φ = 56°, (c) Φ = 110°, and (d) Φ = 146°. 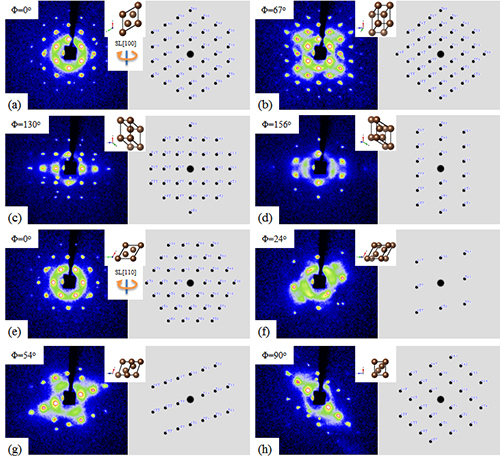 In each pattern, the marked spots represent one typical group of scattering spots along the orientation given in inset, which match well with simulations at the same atomic crystallographic orientation. It is noted that additional spots can be seen in patterns, which originate from either small crystallites or large mosaicity of the supercrystal. "SAXS-Movie 1," 11 Sep. 2015. Amazingly, NC assembly has an unusual obtuse rhombohedral lattice, which is completely different from previous results and our in-box imagination. This structural reconstruction offers all the details about how NCs approach through the tip, edge and facet in an anisotropic way (Figure 4). Each structural aspect of the superlattice enables researchers not only to discover the hot plasmonic spot in nanocube assembly of noble metals for real applications of biomedical imaging and solar energy conversion, but also help design feasible approach for materials processing to create new types of mesomaterials. As one example, they recently used the pressure processing of nanocube assembly in diamond anvil cell and successfully created the highly strained mesoporous structure that retained the high pressure metastable phase to ambient conditions . 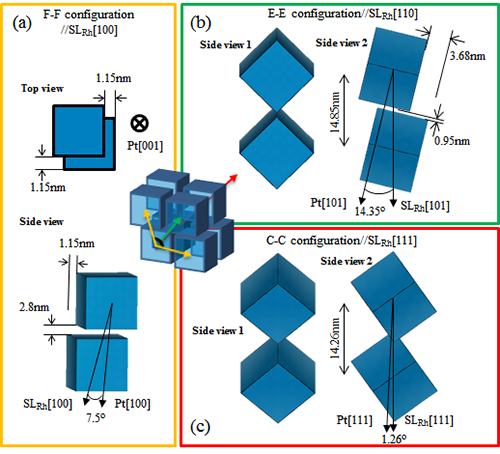 Figure 4: NC packing configurations and a series of defined parameters of neighboring NCs in obtuse rhombohedral superlattice: (a) face-to-face, (b) edge-to-edge, and (c) corner-to-corner configurations. Ruipeng Li, Kaifu Bian, Yuxuan Wang, Hongwu Xu, J. A. Hollingsworth, T. Hanrath, J. Fang and Z. Wang, An obtuse Rhombohedral superlattice assembly by Pt nanocube, Nano Letters, 2015, 15, 6254-6260. T. Wang, R. Li, Z. Quan, W. S. Loc, W. A. Bassett, H. Xu, Y. C. Cao, J. Fang and Z. Wang, Pressure processing of nanocube assemblies toward harvesting of a metastable PbS phase, Adv. Mater. 2015, 27, 4544-4549.